"River", pictured winning the day after he turned 9 months old, is one of our newest "Future Stars". Sired by CH Silversmith Ethan Allen JH, out of our CH Northwoods Brooke v Reiteralm, breeder Christie Majors and Phil and I have high hopes for a bright future for River. River finished his championship at the tender young age of 9 1/2 months. River lives with his co-owner Greg Burdick in Pennsylvania. Click here to see photos of River when he was just a baby. He's a daddy! Click here to see photos of some of River's babies. FLASH...Champion River wins Best Puppy In Sweepstakes at the WCWDCA Specialty Show from the 9-12 month puppy class on October 15, 2005! FLASH!!! 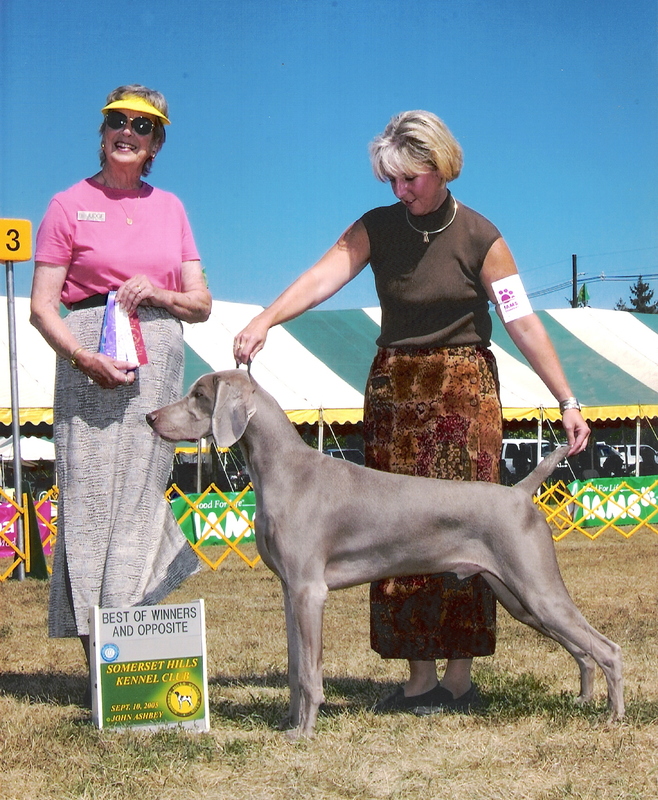 River wins back-to-back Best of Breed awards at the Northeastern Maryland Kennel Club show on Friday 11/25/2005, and again on Saturday 11/26/2005 at the Chesapeake Kennel Club of Maryland, Inc. show. Both of these wins were over Top 10 Specials! 2/14/2006 - HAPPY VALENTINE'S DAY for River! 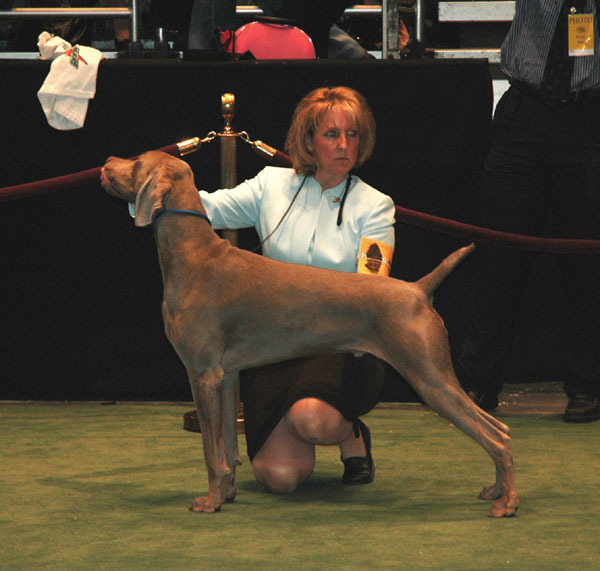 At only 14 months old, and the youngest Weimaraner in the entry, River makes the cut during the Westminster Kennel Club breed judging! FLASH!!! 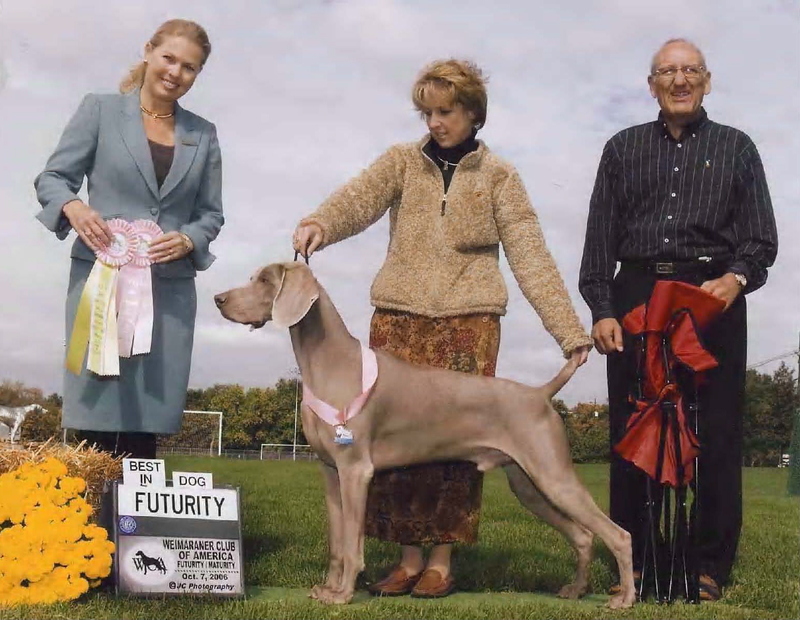 River wins First Place Intermediate Dog and then goes on to win the Best Dog in the Weimaraner Club of America Eastern Futurity show held in North Branch, NJ on October 7, 2006.